Caregivers that look after people with dementia often deal with a wide range natural but inconvenient emotions that can interfere with their work. Many spend countless hours tending to the physical needs of the person with dementia, thereby neglecting their own needs. Dementia home caregivers who find themselves in this situation often experience incredible frustration. Here’s how they can soothe and manage it. 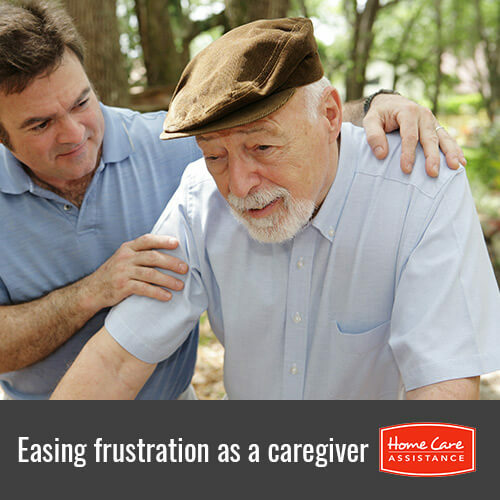 If you are a dementia caregiver, start by recognizing when your own frustration level is starting to build. Many people find that they experience trembling, shortness of breath and other physical signs. Still others find that their emotions start to take control over their rational thinking. When you can identify these warning signs, you can do something to quell your frustration. When you feel your frustration level building, take a few minutes to calm yourself emotionally. Curl up in a chair and get lost in a good novel, cook your favorite meal or work on the art project that you are always putting off. Taking even a few minutes for yourself can often bring frustration levels back to manageable levels. It also helps to take a careful look at the way that you are thinking. Over generalizations, always seeing the negative, jumping to conclusions, making “should” statements, labeling other people and personalizing everything may be signs that a caregiver is feeling very frustrated. Think of these thoughts as a vulture looking for a place to nest in your brain. As a predator, negativity wants to prey on your vulnerability. While you cannot stop negative thoughts altogether, you can quickly change them by making sure that your responsive thoughts are positive. Many caregivers find that journaling helps immensely in this process. Many caregivers do not communicate their own needs effectively, fearing that others will think less of them or that they need to feel guilty for thinking of themselves when their loved ones are the ones that they need to be worrying about. Understand that others are usually more than willing to help, but they may not know what the caregiver needs. You can even turn to a professional Rhode Island respite elder care provider for help when you need it. Caring for a person with dementia is a full-time job. Just like others with full-time jobs, you need to be able to take time off. Reach out to Home Care Assistance today to speak with a friendly Care Manager about our comprehensive respite elderly care in Rhode Island. Our caregivers are highly trained in the latest home care methods to help your loved one age in place with dignity while you give yourself a break. Call (401) 284-0979 today to learn more about our services and schedule a free consultation.